I had some red lentils (which are really orange, so that’s bizarre, isn’t it?) calling to me the other night. Calling at 2:00 a.m. Seriously. I was like “shut up, go to bed.” But that’s the kind of thing that happens when you look at Pinterest before falling asleep. And Red Lentil Dip with a Spanish Flair is what comes of it. Notice how I shamelessly linked you to my Pinterest? I’d love it if you’d follow my boards. Now back to the scheduled programming. And that dip. Oh that fun, smoky, seriously delish dip. 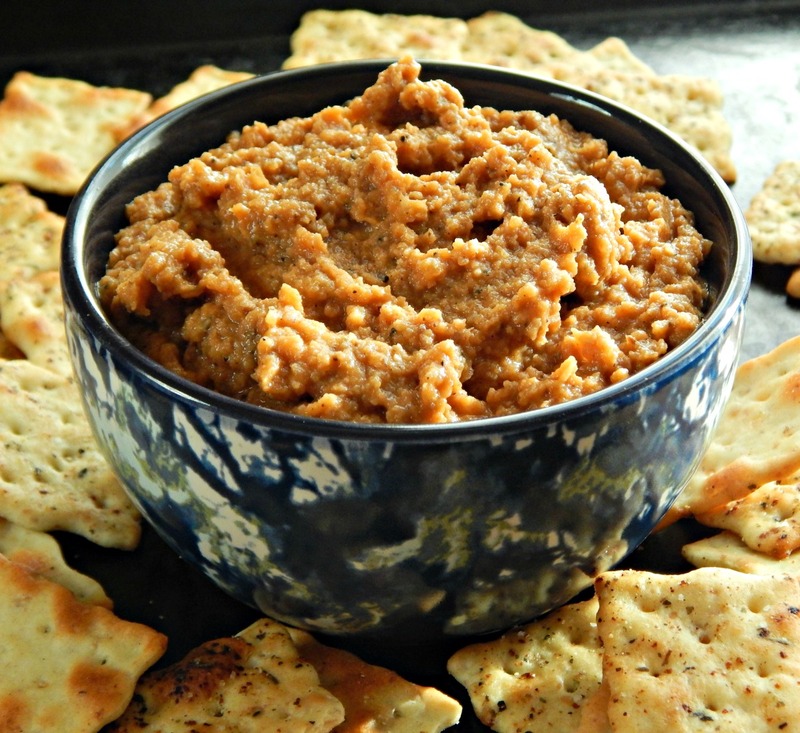 This Red Lentil Dip with a Spanish Flair is substantial but light and creamy and the smoky flavor carries over and marries so well with the garlic and wine. And that vinegar at the end makes it all just kinda pop with flavor. It’s compelling. I could just eat it with a spoon. Better than Ben & Jerry’s at 2:00 a.m. This “only” makes two cups, so if you’re having a party of more than one, like I had last night, make more. People will be dipping into this and piling on as much as a cracker or pita chip can hold. That hardly matters, though, because its super healthy. Not that anyone would care, though, it’s so good. I was inspired by several recipes but based this loosely from one in Chowhound. I changed it up a bit. And if I happened to have my Sofrito stashed in the freezer, I’d use it instead of tomato paste. Or maybe I’d toss in some Harissa. This is the kind of recipe, tasty as it is, that can take a lot of riffing. I love that, don’t you? Perfect for last-minute, throw together gatherings. Or middle of the night snacks, lol! As far as shopping, look for beans & lentils to go on sale after a big holiday, often unadvertised. Just about any white wine will do but sign up on an email list for sales alerts. You’ll often see big wine sales in February. Mushrooms are drastically reduced during any Holiday week. Poke a hole in the bottom of the package and store upside down and they’ll last a bit longer. In a small saucepan, bring the water to a boil over high heat. Add the lentils, reduce the heat to low, and simmer until most of the liquid has been absorbed, about 15 minutes. Keep an eye on them toward the end. Drain through a fine-mesh strainer. Add mushrooms and onions to the bowl of a food processor and finely chop. Heat the oil in a large frying pan over medium-high heat until shimmering. Add the onion and mushrooms and cook, stirring occasionally, until the vegetables soften and start to brown, about four to five minutes. Add the garlic and cook until fragrant, about 2 minutes. Turn the heat down to low and add the tomato paste and stir it around, until it loses its bright red color. Add in the paprika, oregano and black pepper and stir to coat the onion mixture. Add the white wine, using a wooden spoon to scrape up any browned bits sticking to the pan. Simmer, turning the heat back up if necessary, until the wine has reduced and the mixture has thickened, about 3 minutes. Remove from the heat and let cool slightly. Transfer the mixture to the bowl of a food processor fitted with a blade. Add the cooked lentils and vinegar, season generously with salt, and process until mostly smooth, with some small pieces remaining, about 1 minute. Taste, season with additional salt and pepper as needed, and pulse to combine. Serve warm or cold over toast points, crostini, with crackers, pita chips or raw or roasted vegetables. This is particularly good with roasted cauliflower. This entry was posted in Click here for Fabulous Food Posts and tagged Alcohol, Appetizer, Frugal Hausfrau, Lentil, mushrooms, Spanish, Spreads and Dips, Wine. Bookmark the permalink. Hi Mollie! Looks perfect for pre-dinner drinks with friends. Healthy enough and not too filling to spoil dinner. thanks! I’m so glad you liked that stuffing! I’ll have to tell my sis, lol! 🙂 This is a great dip, and I loved my little midnight snack but it was even better the next day. 🙂 Happy New Years to you! Your dip sounds good, nice to have a healthy one in the repertoire. Thanks for the tip on the mushroom storage, I’ll give that a try. Lovely Mollie – lentils are so good for you too so this dip is a winner for me! I love lentils (and chickpeas, too) so healthy, cheap and so good for you! I would definitely take your lentil dip over Ben & Jerry’s any day! I’ve never tried lentil dip but this looks so good! OMG Mollie, did you really make this at 2 am? Or just come up with the idea for it then? LOL. It looks and sounds amazing!